Dennis Blieden is now 1-for-1 in World Poker Tour events he's entered after winning the L.A. Poker Classic Thursday night (Joe Giron/WPT photo). 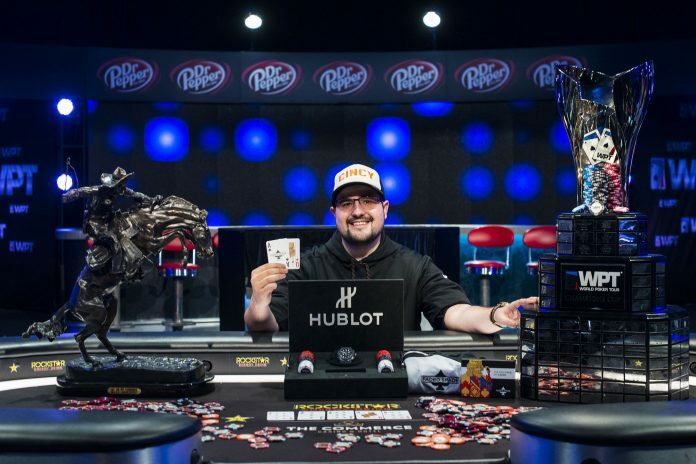 Last August, Art Papazyan entered and won the first World Poker Tour event he ever played when he beat Phil Hellmuth heads-up to win the Legends of Poker event. That scenario repeated itself Thursday night as Dennis Blieden, playing in his first WPT event, beat Toby Lewis heads-up to win the L.A. Poker Classic and walk away with $1,000,000. When the final table began, Manuel Martinez was at the bottom of the chip counts looking up. That situation didn’t last long – but not in the way that Martinez had hoped. From UTG, Martinez raised to 60,000 and Blieden defended the big blind. After the flop, Blieden check-raised Martinez’s 50,000 bet to 175,000 and Martinez called. The turn was the and Blieden lead out this time for 230,000 before Martinez moved all in for 675,000. Blieden called and tabled for a turned full house while Martinez was left looking for two outs with . The river was the to eliminate Martinez in sixth place. Blieden continued to build his stack and picked up another elimination just eight hands later. Blieden raised to 65,000 from the cutoff before Peter Hengsakul moved all in from the big blind for 560,000 total. Blieden called and showed which had him ahead of Hengsakul’s . The board ran out [t2] to miss Hengsakul and send him out in fifth place. The first two eliminations came quickly, but the third took some time. 43 hands after Hengsakul was eliminated, Marc Macdonnell clashed with Toby Lewis and saw his run end early. Macdonnell moved all in for 1,105,000 from the button and Lewis called from the big blind. Macdonnell showed while Lewis showed . The flop gave Lewis middle set and as the turn and river were dealt, all Macdonnell could do was watch as he was eliminated in fourth place. Blieden continued his push towards the title just 20 hands later when he sent yet another player to the rail. Lewis folded the button before Derek Wolters moved all in for his last 355,000 and Blieden called from the big blind. Wolters was behind but drawing live after tabling and seeing Blieden show . The flop moved Blieden even further ahead and the turn river actually gave Blieden an unneeded flush as Wolters busted in third place. When heads-up play started, Blieden had Lewis out-chipped by a nearly 4-1 margin. It took only two hands for Blieden to end the tournament. Lewis raised to 120,000, Blieden made it 300,000 and Lewis clicked back to 750,000. Blieden called and then checked the flop. Lewis bet 400,000 and Blieden called. The turn was the and Blieden checked again. This time, Lewis moved all in for 2,200,000 and Blieden called after asking for a count. Blieden showed and Lewis could only watch in disbelief after tabling . The river was the to eliminate Lewis and give Blieden his first major live win and $1,000,000 and entry into the WPT Tournament of Champions this May in Las Vegas.